It is somewhat of a joke that we love to toss around here that LG copies pretty much everything that Samsung does or attempt to beat them to the punch. When news like the latest leak from LG appear however, it is really not a joke anymore. 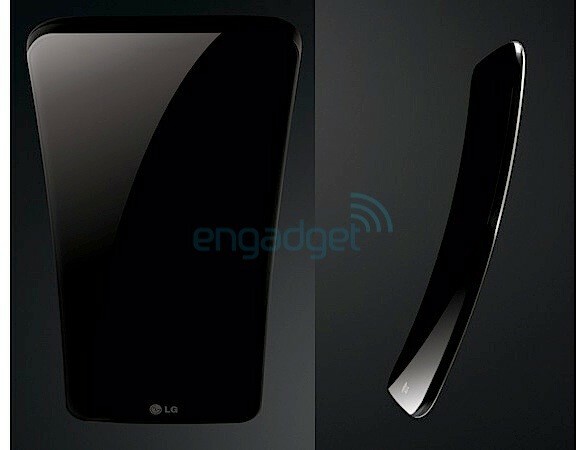 If you will remember, the night before Samsung announced the Galaxy Round, LG put out a press release that amounted to “we have curved displays coming soon too!” Now we have leaked renders of a device named the LG G Flex that shows what they meant. There are a few differences though between the Galaxy Round and this G Flex. LG will be sure to make a point that the screen is curved along the horizontal axis, whereas Samsung’s is across the vertical (taco phone). The G Flex is also massive, featuring a full 6″ display as opposed to the 5.7″ of Samsung. Engadget says that we can expect to see this device within the coming month, or we can guess around the time that Samsung launches the Galaxy Round. Are you interested at all in curved displays like this in your phone? HTC Announces the One Max, An Oversized Phone Just to Say "Hey, We Have a Big Phone Too!"